The 9th edition of the Myanmar School of Politics (MySoP) core course started in Tanintharyi Region on 22 July 2017. Chief Minister Dr. Lai Lai Maw opened the 16-day training retreat with a speech noting the importance of politicians contributing to their societies, and that a politician should never stop trying to improve oneself in order to continue to increase that contribution. 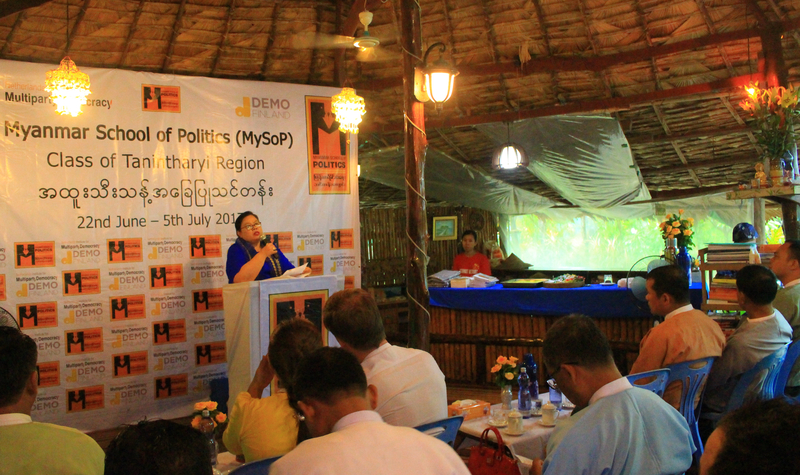 The Tanintharyi Chief Minister herself is an alumni of the very first MySoP core course in 2014. Held in the beach town of Maung Magan, the course brings together 15 leadership politicians from 7 different political parties alongside the Election Sub-Commission. Together they will study political theory and practice their democratic skills. The course curriculum includes political ideologies, elections, gender in politics, speech writing, campaigning, debating, dialogue and environmentally sustainable economic growth.